Helicopter crew chiefs, UH-1; are flight crewmembers who maintain and oversee operations aboard Marine UH-1 "Huey" helicopters. Besides the pilot, the person with the most important job on a Marine helicopter is the crew chief. This person is responsible for the overall well-being of the helicopter and its crew, particularly the operations necessary in the rear of the helicopter. A helicopter crew chief helps the pilot with in-flight instruction and safety measures, alerts the pilot to any obstacles not visible from the pilot's point of view. Since most helicopters don't have great sightlines, the pilots can't always see what's not directly in front of the aircraft's nose. It's up to the crew chief to alert the pilots of potential collisions or of enemy fire or aircraft. This role is open to Marines between the ranks of private and gunnery sergeant. It's categorized as a military occupational specialty (MOS) 6174. This helicopter is used primarily in combat situations, providing medical evacuation and other combat support. It may be involved in aerial reconnaissance, assault support, close air support, and command and control missions. The Huey has been part of the U.S. military since 1956 and was used widely by the Army during the Vietnam War. It's gone through several redesigns and upgrades since, with alterations to its cabin size, the number of guns it can support, and the number of rotors. The Huey is known for being a loud aircraft with an intimidating sound. In order to be eligible to serve as a Marine helicopter crew chief, you'll need a score of 105 or higher in the mechanical maintenance section of the Armed Services Vocational Aptitude Battery (ASVAB) tests. You have to have normal color perception since a huge part of this job is acting as a lookout. Since you'll be handling delicate operational information and be involved in combat situations, you must be able to qualify for a secret security clearance from the Department of Defense. This security clearance can take several weeks to complete and will involve a check of your background and finances. A criminal record may be grounds for denying this clearance, and any history of alcohol abuse or illegal drug use also may be disqualifying. Marines in this job must pass the second-class swimming test (or higher), and volunteer for duties involving flight as an aircraft crew member. 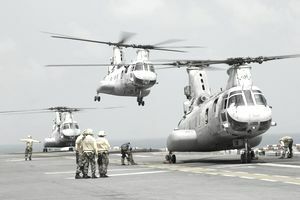 Some Marines who initially trained as crew chiefs later seek training as pilots, which requires that they attend and pass Marine flight school training. After basic training, or boot camp, which is held either at Parris Island, South Carolina or San Diego, candidates for this job attend Naval Aviation Aircrewman candidate school at the Naval Air Station in Pensacola, Florida. Next, they'll attend Survival, Evasion, Resistance, and Escape (SERE) school in Brunswick, Maine. Then they'll take the crew chief training program in New River, North Carolina or the Marine enlisted aircrew flight training at Camp Pendleton in California.